This is model and actress Emily Ratajkowski. In 2017, she launched Inamorata, a line of swimwear which aims to “reject the old tired myths about body image” and “embrace the full spectrum of the female form”. Emily often shares photos of the line on her personal Instagram, and on Tuesday she posted this photo of herself and a friend lying side-by-side on the beach. The post was immediately flooded with hateful comments, comparing Emily’s body with her friend’s and body-shaming both of them. In addition to the body-shaming comments, people said Emily should never have posted the photo. One person said it was a “hate crime” against the friend. “Why would she subject her friend to this humiliation and online bullying by posting this?” another person said. Some even went so far as to suggest that Emily had posted the photo on purpose to make herself look “good”. A few people jumped to Emily’s defence, saying the people who said she shouldn’t have posted the photo are themselves contributing to the body-shaming they claim to be against. 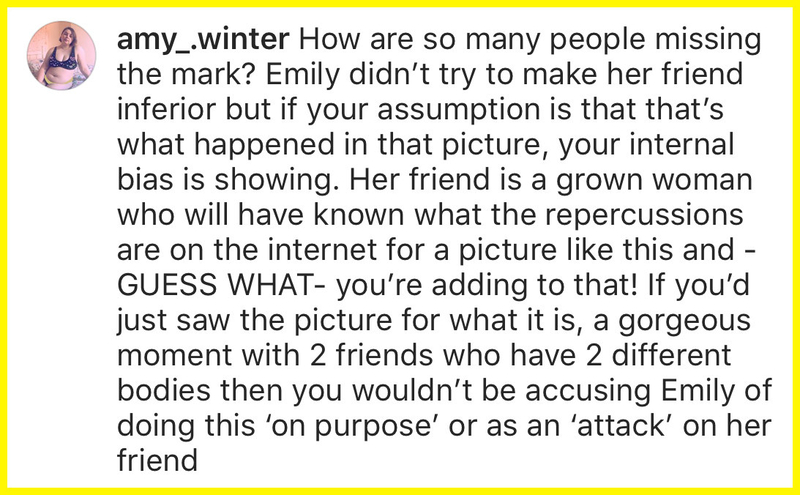 They also pointed out that the friend in the photo most likely gave her consent for Emily to post it. And Emily responded to one comment, agreeing that just because people are used to seeing a specific body type, “doesn’t mean that that’s the only kind that should be considered ‘beautiful'”. But it didn’t stop there. 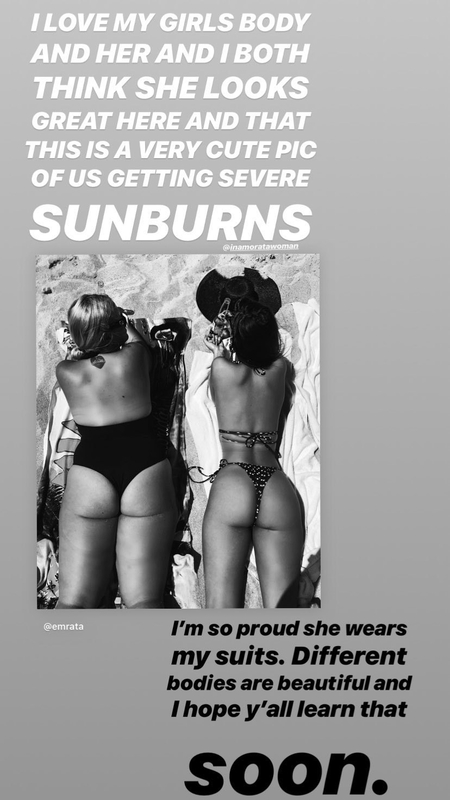 Emily also addressed the situation in a post on her Instagram story, saying she and her friend “both think she looks great here and that this is a very cute pic of us getting severe sunburns”.